"CMOS Switch Buck DC-DC Converter Fabricated in Organic Interposer with Embedded Zn-Fe Ferrite Core Inductor", Vol.39, No.2, pp.71-79 (2015), a paper published in the Journal of the Magnetics Society of Japan, won the 2015 academic year Magnetics Society of Japan Distinguished Paper Award (one other paper was also granted this award during the same year). The content of this paper relates to basic technologies for a direct-current power grid for a System in Package in which the CPU, memory, censors etc. are integrated on the same circuit. The paper gives a detailed description of integrated technologies for the interposer boards of DC-DC converters that include a Zn-Fe ferrite core inductor. The paper represents a compilation of a diverse body of research and development, including synthetic approaches to Zn-Fe ferrite thick film for inductors imbedded in packages, the development of processes for imbedded inductors, and optimal designs for CMOS switches and installing to DC-DC converter circuits. This paper was recommended for the award for the following reasons. "The members of this collaborative research project have set challenging goals, and are utilizing advanced manufacturing technologies to conduct trial manufacturing of power supply devices. Meanwhile, as this paper shows, they have also approached their subject in a consistent and logical manner, and have demonstrated why inductors with high Q values are needed to enhance the efficiency of power supply devices. The insights gained from this paper are expected to contribute to further developments in this field." A total of 11 members received the award. In order of authorship (titles omitted): Kazuhiro Hagita, Yuichiro Yazaki, Yuta Kondo, Makoto Sonehara, Toshiro Sato (Shinshu University), Tomoharu Fujii (SHINKO ELECTRIC INDUSTRIES CO.,LTD), Nobuhiro Matsushita (Tokyo Institute of Technology), Teruki Someya, Yuki Yanagihara, Makoto Takamiya, and Takayasu Sakurai (University of Tokyo). This research project started out from its selection for the 2011 academic year Shinshu University Green Innovation Research Support Project, and was headed by Professor Toshiro Sato (Department of Electrical and Electronic Engineering, Faculty of Engineering). Since then, it has developed into a project that has been funded under a Grant-in-aid for Scientific Research, and into a collaborative research venture (SHINKO ELECTRIC INDUSTRIES CO.,LTD). From the 2015 academic year, it was selected for the Semiconductor Industry Research Institute (STARC) Research Project through investment from five semiconductor manufacturers. With Associate Professor Kosuke Miyaji (Department of Electrical and Electronic Engineering, Faculty of Engineering) as research representative, under the theme of developing three dimensional integrated DC-DC converters, the group is further pursuing its research, with the aim of implementing the results in society. The award ceremony was held during the 39th Magnetics Society of Japan General Conference (September 8 - 11, Nagoya University Higashiyama Campus). 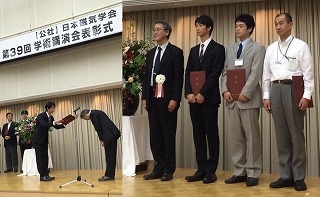 Three members of Shinshu University attended the award ceremony to receive the award: Yuta Kondo (2nd year student, Department of Electrical and Electronic Engineering, Graduate School of Science and Technology), Associate Professor Makoto Sonehara (Department of Electrical and Electronic Engineering, Faculty of Engineering) and Professor Toshiro Sato (ibid).